I thought I’d start with the hub and work outwards. As such I decided to spend an afternoon working at the Nottingham Central Library. In total the city has 15 libraries, 14 smaller branch libraries and the central library. I’m unsure of the history of the Central Library, it doesn’t have the grandeur of even a market town library, that’s partly because the Nottingham Trent Arkwright Building was the original city main library and museum and became the Nottingham Polytechnic when the Newton building was added. The current central library puts me in mind of a department store building, which it is quite possible it was something like that before. The library is not spacious, but feels well laid out for the shape. The fixtures and fittings are very thread bare and there are signs of build damage from water ingress all over. The carpet is disgusting. However the space is functional and tended with some care. 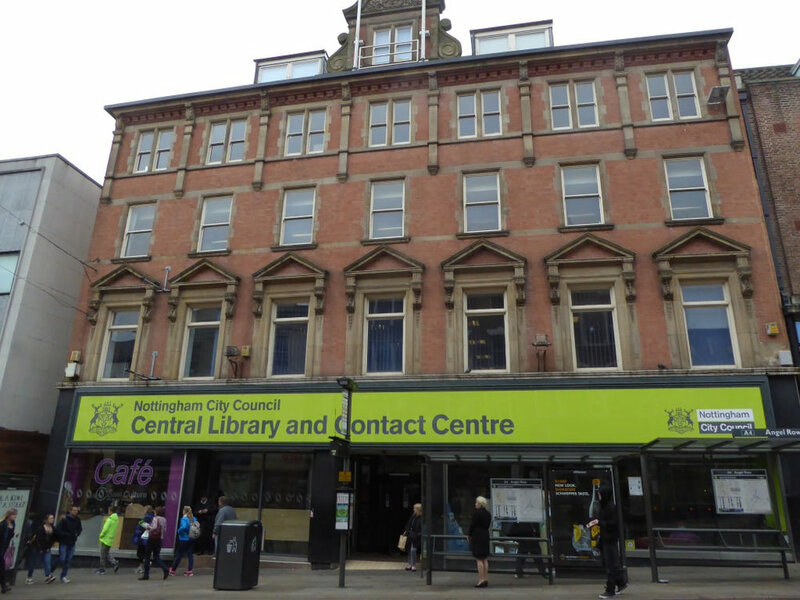 Much of the ground floor area is turned over to the “contact centre” which is a place for Nottingham City Residence to be able to speak to someone from the city council face to face for matters relating to the council. This service is offered in a number of the libraries around the city. The facility ranges across 4 floors and includes a local history collection, business and IP centre, foreign language sections, accessible access with lifts, automatic doors and ramps. vending machines including hot drinks, print shop, public access computers and public WiFi through GovWifi. I went to the library on a Thursday afternoon and went directly to a staff desk and asked to become a library member. I was asked for some ID that showed my address, I handed them my drivers licence and they handed me a form to complete, which I did. On returning the form I was handed my library card. The only odd thing on the form was a section asking if I was male or female which seemed a little dated to me and didn’t seem like an especially important question for a library to ask so I wrote “why is this important?” across the question box. The library assistant that was helping me didn’t bat an eyelid at this. I asked “May I work with my laptop here?” and was told yes, and there are desks set out along the wall on the 2nd floor, do you need Wifi? Here is how to set it up. “Can I plug in for power?” Yes. I was told. A few of the desks are near sockets. I was handed some paper info about logging in on their PCs and told that I’d have access to everything except saving data. “Could I bring a USB stick?” Yes, I was told. I grabbed a couple of other leaflets including a list of all 15 libraries with opening times. Connecting to the Wifi, which is provided by GovWiFi, was very easy indeed. GovWiFi is a national initiative but its hard (well… probably not so hard) to find anything much about it’s origins. However it is pretty good. Obviously I have no idea how secure it is, treat it as any public Wifi. The furniture arranged on the 2nd floor for working at was functional though a little tired. It looked like they’d found some desks at a surplus sale. They also had some privacy and sound absorption screens the desks being designed for just one person and arranged like booths at a diner. I could have chosen to sit at a larger table that could seat about 8 to 10 people. I quite like larger communal desks generally but each of the tables was in use. Here, mostly men sat alone or in groups. One man in a long black coat and woollen hat and many layers of clothing pawed over his smart phone, I assume taking advantage of the Wifi. Another group felt like a mixture of carers and their wards talk loudly about each other and the potential deposition of Mrs Theresa May (it being the day before the supposed Brexit on the 29th March 2019 (that ones for you historians)). Toilets were clean though tired. In the community gallery, there was a display related to architecture, including some professional models, photography and a display of architectural forms that had been made at some workshops run at the library. To the sides, meeting rooms (possibly bookable?) and a business support and IP centre were evident. My understanding is that a new fancy library is to be developed in the area left empty by the demolition of the Broadmarsh carpark. This would be closer to the Station and I suppose significantly the courts and council offices in Loxley House on Trent Street, which it only just occurred to me is much closer to the East Croft Dept. Putting lots of the main council services close together. 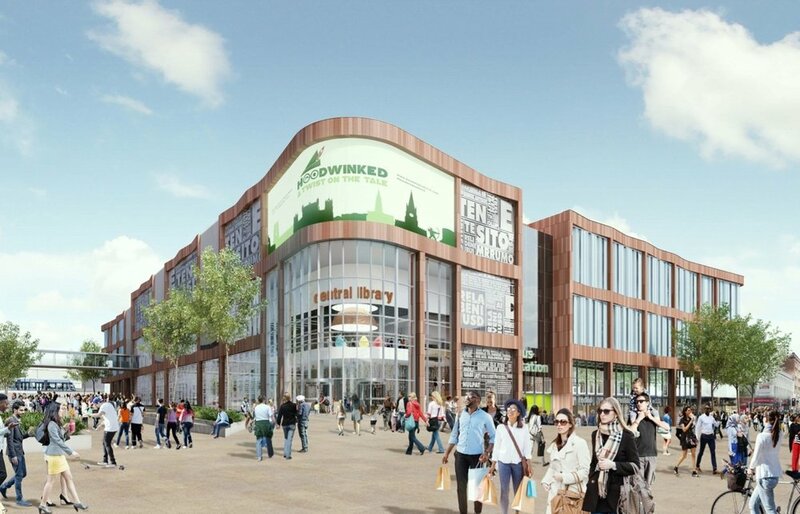 The proposed new central library in Broadmarsh, Nottingham. I don’t have any conclusions. If anything I’m feeling fairly overwhelmed by libraries. I’m getting to feeling like I’ve been trying to re-invent libraries and ignoring their existence somewhat. I feel pretty confident in the idea that most people do not use their libraries. Sure they might if they have kids, but when (most) people think of libraries they think about books. I personally think the library should be about much much more than books (and of course they are) even to the extent of having fewer books on stacks. It could come across as a fairly flippant remark and that’s not the intention. I am fully aware that a major objective of the library is literacy and access to the written word. At this juncture people assume I’m talking about on-line writing and ebooks. I think they are relevant too and are already available through the library system usually in most parts of the UK. No, what I’m interested in is more meeting spaces, more work spaces, tool libraries and makerspaces. I hesitate too, because I do not wish to gentrify the library space. It’s clear that the library is serving a section of society that is highly vulnerable and that does not have a large influence. These are the poor, the homeless, the elderly and those who might not be immigrants, asylum seekers or otherwise displaced humanity. I’ll resist my urge to prettify the spaces into a version of my favourite coffee house with £4 lattes and shabby-sheik sofas. However, the buildings can be simple AND inspiring as I’ve seen with some libraries elsewhere, Exeter and Liverpool sprint to mind. I will be watching the development of the Central Library with interest. I wonder if they plan to have a makerspace? Today’s thumbnail is a view of Old Market Square and The Council House taken from Angel Row, Nottingham (just as I left Central Library) yes, its got a tram in it.